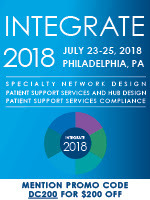 This July 23-25, Philadelphia will become home to Integrate 2018 featuring three one-day Pre-Summits and three Full Summits. Truly customize your experience by selecting one-, two-, or three-day options and the specific tracks of your choice. One ticket price allows you access to any session from any of the three main day Summits. Register with discount code DC200 and save $200 off of current registration rates! Attendees will have the opportunity to break down silos and engage in forward-thinking discussions with cross-functional colleagues in order to develop best practices for improving support and access from manufacturer to patient, provider and networks. Otsuka Pharmaceuticals | Walgreens | UPMC Health Plan | Pfizer | LuckFupus | Patient Advocate Foundation | CVS Specialty Pharmacy | Asembia | Accredo Express Scripts | Teva | Chiesi USA | Eisai | Sandoz Novartis | and many more! Don’t miss out on this opportunity to experience unprecedented value, networking and education. Register with discount code DC200 and save $200 off of current registration rates!